For effective plaque and stain removal. 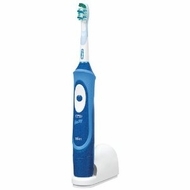 The Oral-B Vitality Sonic rechargeable electric toothbrush uses advanced sonic technology to drive CrissCross¿ bristles nearly 20,000 times per minute. Vitality Sonic reduces plaque effectively and removes surface stains to naturally whiten teeth.